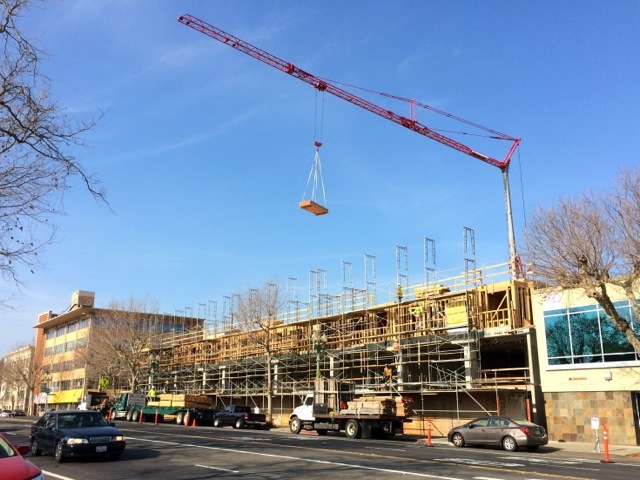 I was spending some time walking through my old neighborhood in Oakland near Lake Merritt on Wednesday, when I came across something I don’t think I ever saw in the more than three years I lived there: a big ol’ construction crane. Formerly a rather uninspiring parking lot, this project at 460 Grand Ave. overlooks the lake, is in the middle of a blossoming retail corridor of new bistros and a gourmet spice shop, and it’s a relatively short walk to Uptown, BART and the popular weekend Grand Lake Farmer’s Market. It’s an incredibly desirable location, so imagine my surprise when I discovered that the building is slated for 68 units of affordable housing (plus ground-floor retail space). In fact, the commentors over at this here real estate site think the location is so darn desirable that the Oakland Housing Authority should have allowed the property to be developed for market-rate housing and used the proceeds to build affordable housing elsewhere in the city—you know, in places where rich people don’t want to live. There’s a certain logic to that argument that I suppose is worth considering, but there’s also a severe need for affordable housing in this neighborhood. Of course, there’s a fast-growing need for affordable housing all over Oakland, but I know just how much rents have shot up in this area in the last few years. Let’s just say our former landlord was not too sorry to see us move out, knowing that our one-bedroom apartment could easily support $800-$1,000 more per month than what we’d been paying. And I know of few other options for development in this area. Without calling the Oakland Housing Authority up to ask them what they were thinking, I’m pretty sure that’s what they were thinking. AvéVista Apartments are due for completion in summer. This entry was posted in Developing Story, Photos, Urban Planning and tagged affordable housing, construction, Lake Merritt, Oakland. Bookmark the permalink.